Thanks to KXSC, I was able to go to Desert Daze festival, held at the Institute of Mentalphysics in Joshua Tree, California from October 14th through 16th. Described as a “not a ‘music festival’, but a ‘festival of music’”, this was the fifth year that Desert Daze was held and the first year that it was three days long instead of one day. In many ways this stage in the evolution of the festival made for an ideal experience. The organizers, Moon Block Party, were experienced enough that all the logistics ran smoothly, and since this was the first year at this scale, it was not overly hyped or too crowded. The lineup was eclectic, featuring Washed Out, Primus, Godspeed You Black Emperor!, and Television as headliners with Andrew WK and Saul Williams leading the opening and closing ceremonies respectively. The diversity of the artists attracted a wide range of attendees from old sundrenched hippies to post metal heads to Angeleno revivalist hipsters to burners preaching PLUR. To see all these people in one placed, decked to the nines, and exuding positive vibes to all was at a bare minimum entertaining people-watching and at some higher level inspiringly lovely. With 3 stages and overlapping sets, it would have been impossible to see all the artists. So, I made a playlist on Spotify with a song from every artist to help me review and prioritize in advance. Of all the sets I watched, I’ve picked my top three from each day of the festival to feature. Bonus: I took some photos that I’m rather proud of for your viewing pleasure. Enjoy! 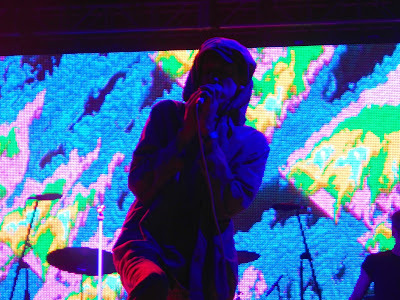 This was definitely the indie pop chillwave day of the fest with Toro Y Moi, Washed Out, and Deerhunter headlining. Toro Y Moi is one of several artistic facets of Chaz Bundick, who was also playing on Saturday as Les Sins, his more pop producer type persona. As Toro Y Moi, Bundick quickly got the large crow grooving’. Though it was the first day of the fest, and there were still lines of people picking up tickets after battling L.A. traffic out to the desert, the good vides were already in abundance. Never one to shy away from back catalog (in 2012 he released June 2009, an unreleased album of very early recordings that had a very different sound), Bundick played his best work from his 6 albums and 2 Eps, including ‘Talamak’, ‘New Beat’, ‘Rose Quartz’, and ‘Buffalo’. The intimate camaraderie between Bundick and his band seemed to permeate from the stage and into sizable crowd in attendance, who clamored for an encore. I had seen Toro Y Moi live several times before, but I had never seen Washed Out. I tried to keep my excitement and expectations at a reasonable level as I waited for his set to start, but I was buzzing with anticipation. Turns out Washed Out, a.k.a. Ernest Greene, is every bit as devastatingly charming as my wildest day dreams had imagined. He seemed truly humbled and honored that ardent audience had assembled to hear him play. 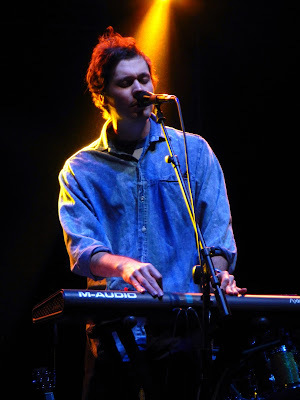 Though Washed Out had not played live in over a year, Greene and his band still killed it, switching out instruments between five people and at one point blending four synths together. Before playing ‘New Theory’, he shared that the reason they hadn’t been playing shows was that he had been holed up recording and was almost ready to release a new album. Huge news given that since Paracosm dropped in 2013 there’s only been one single released. Now I really can’t contain my excitement! Deerhunter finished the evening and frontman Bradford Cox proved once again that he is a consummate performer. He emerged from the shadows clothed all in grey, including an oversized windbreaker with a deep hood that concealed his face in shadows. The stage lighting made it a little hard to tell, but I think his face and hands may have been painted grey as well. This aesthetic was at odds with their more upbeat songs, but Cox double downed on the theatricality of his performance and played to the crowd, not showing his face until almost halfway through the set. Deerhunter played a number of their better known songs, including ‘Revival’, but Cox kept it weird by announcing that he had peed down his leg a little and ostentatiously inviting a woman on stage, who he claimed was his sister, Hannah. With both of these casual comments, it was almost impossible to tell if he was serious of not. Though it was past midnight and people were clearly fading, the band stepped up the energy as the night went on and was able to rope the audience back in with sheer solid talent and force of will.